At Dexcon over the weekend, I had the chance to play one of my new go-to two-player games, Jack Rosetree's ABXY, published by Broken Games. The company's name is a misnomer - the game's amazing. Over the course of the weekend, I played five games, and then taught it to a friend of mine on the 4th of July, right after the convention ended. 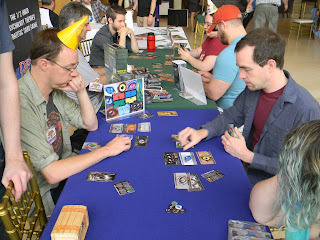 Yup, that's me in a Big Bird party hat playing ABXY at DexCon. During setup, each player receives 5 random creatures (out of a total of 20) to do battle and places one out as their active combatant, placing the other four off to the side. Players then take their four button cards: A, B, X, and Y. A attacks the opponent, dealing damage. B defends, preventing and countering damage, injuring the attacking creature instead. X allows the player to switch out the active combatant for another creature in their supply. Y is the "taunt"; while it has no effect against A or Y, if an opponent plays B when you taunt, their B becomes "locked out" - unplayable until that creature dies or is switched out. And if an opponent plays X to switch out one of their creatures when you play Y, you choose the creature that gets switched in. 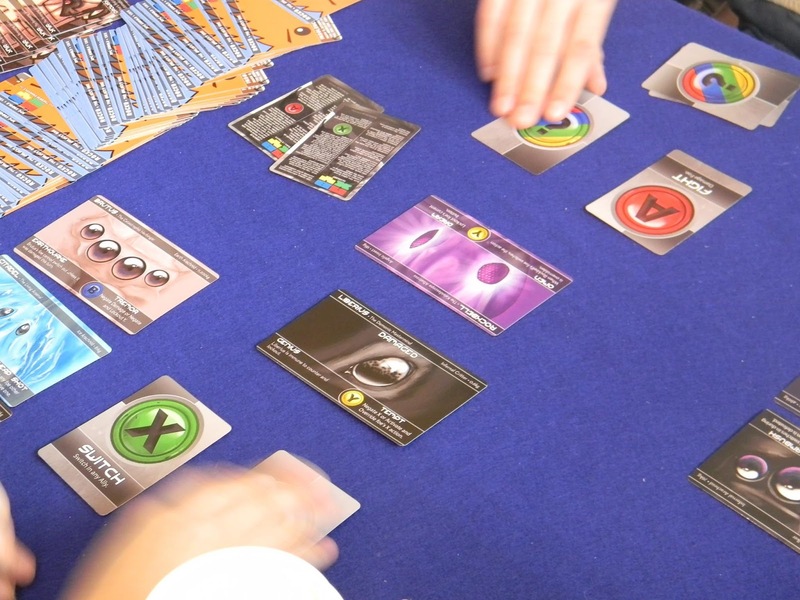 Players select their button cards simultaneously, choosing two cards at the start of each turn. Players then flip the first of their button cards, resolve the effects, then flip their second button cards, and resolve the effects. Mechanically, the game is quite simple in the very best of ways. Here's Kremlin, one of the twenty creatures in ABXY. Its passive ability is brutal. Kremlin's passive ability, Pounce, is listed on the left. When you switch it in, it deals damage to your opponent if they aren't blocking. Its activated ability, Prowl, occurs when the player uses the B button, and it replaces the usual B ability. So, with Kremlin, rather than preventing and countering damage, Kremlin can take a hit to lockout A - but only if Kremlin plays its B against an opponent's A. 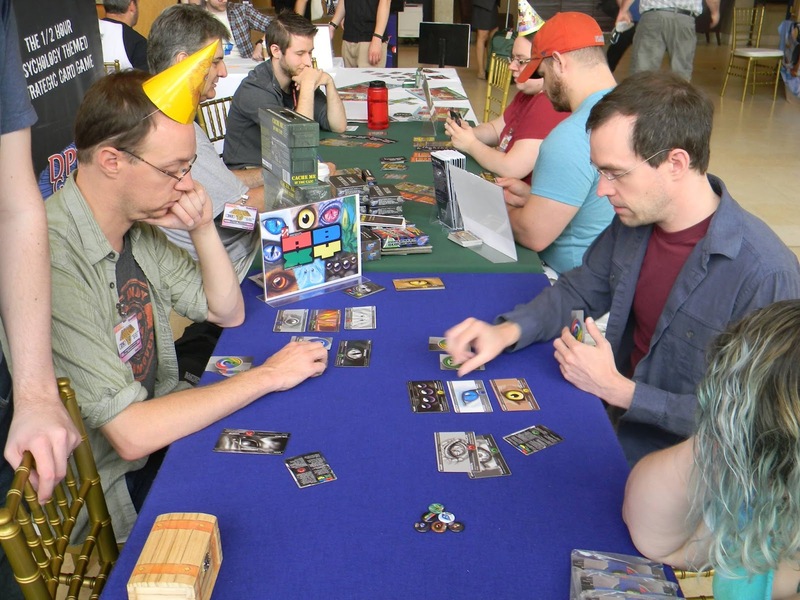 Play continues until one player loses all of their creatures. Games usually last about 10 minutes. ABXY is a nearly perfect two-player filler game. It's simple to teach, but the complexity of the interactions of creatures lends itself to what I expect to be countless replays. At its core, ABXY is a game of poison cups - but unlike many poison cup games, there are optimal plays for each creature, leading to enough information to actually make poison cup decisions meaningful. While I generally hate programming games for their potential for frustration due to having to select actions too many turns ahead, this game skirts that issue by only programming ahead one move. And unlike many programming games where there's nearly interminable downtime if one player agonizes over decisions, with only two two make from a possible four, that wasn't an issue in any of the games that I played. Players getting ready to reveal their second button cards in ABXY. In terms of the presentation, the art is compelling, and the choice to focus on one of the creature's eyes (or half of their eyes, as we see with some of the insects in the game) reinforces the fact that this is a stare-your-opponent-in-their-eyes-and-bluff-the-hell-out-of-them game. 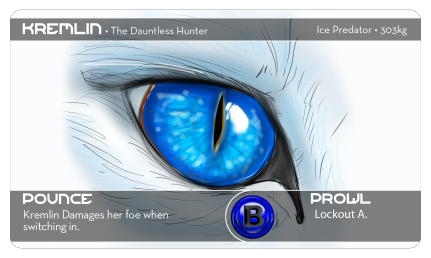 The layout on the cards is clean, and the only extraneous information (since there are variants that rely on their types - like "Ice Predator" for Kremlin) is the description after the creature's name, like "The Dauntless Hunter" for Kremlin - and to get a bit more theme for three words is a great trade-off. Since this is a prototype edition, my one critique of the art - that it doesn't quite fill the card - is going to be moot with the final version of the game. Rather than a flat, color matched space, the illustrations will extend to the edges. Bottom line: Jack Rosetree's ABXY is well worth your money and time and is a great two-player poison cup game. Doug Levandowski is a game designer who co-created Gothic Doctor, co-created UnPub: The UnPublished Card Game, and created You're Fired. He has other designs in the works, too - because that's what designers do. When Doug's not designing, writing articles, sleeping, or playing Star Realms on his phone, he's teaching English to a bunch of amazing high schoolers. You can find him on Twitter at @levzilla and on Star Realms as DougLev, where he'd love to lose to you.